In the second half of the “regular time”, the Champion of the World possessed the initiative. After missing excellent chances with White, she managed to equalize in the fourth game, and the title went on tie-break. In the third game, Lagno, with Black, entered the King’s Indian variation in which she had defeated Socko at the last year European Rapid Championship. 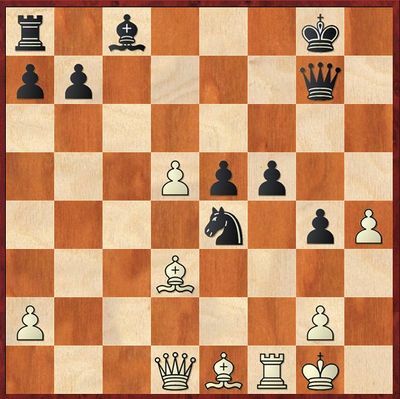 On the move 10, Ju Wenjun employed a rare capture with knight. Lagno’s reaction was far from perfect: she delayed with development of her queenside and lost tempi on taking a pawn (to grab an exchange as well would be too risky). Further procrastination with mobilizing her forces might cost Black dear. It was time to play 16…Nd7, planning …Ne5. After 16…c4? 17.Bxc4 Rxe4,there already emerges the motif of a combinational blow that could have decided the outcome in a few moves: 18.Qc2 Re5 (18…Bf5 19.Bd3; 18…Re8 19.Nh5) 19.Ne6! Less energetic 18.Bd3 Re5 19.f3 h5 20.Be2 allowed Black to return to the idea of developing queenside– 20…Nd7, though even here she also faces difficulties. 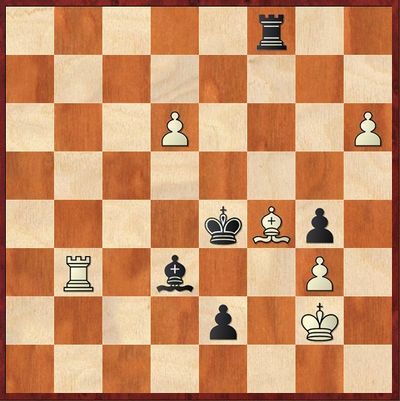 Instead, Lagno chose 20…Qd7?, clinging to the g4-pawn. Here Ju carried out an awkward maneuver 21.Rb4 Na6 22.Re4 and promptly frittered away almost all her advantage. After 21.fxg4 hxg4 22.Ne6!, Black’s position collapses: 22…fxe6 (22…Rxe2 23.Nxg7 Qe7 24.Nh5 with a “free” crushing attack) 23.Bxe5 dxe5 (on 23…Bxe5, there is already a very strong retort 24.Rb4!) 24.Bxg4, and, to parry threats, Black has to give up at least a piece. Having wormed out of an unpleasant situation, Lagno immediately makes a positional error. After 28…Nd6 29.Bb4, the knight is unable to remain on the blockade square, but with 29…e4! Black manages to retain a healthy pawn formation and has every right to hope for a desired outcome. If 48.Kf2? Rxf4+! 49.gxf4 g3+, then black pawns are first to reach the target. 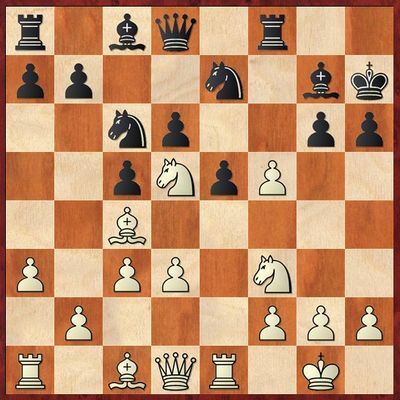 After the text continuation 48.Rb4+ Kd5 49.Kf2, Lagno forced exchange of the rooks: 49…Re8 50.Bd2 (50.Ke1 Ra8) 50…Rf8+ 51.Bf4 Re8 52.Bd2 Rf8+ 53.Rf4 Rxf4+ 54.Bxf4 Ke6. White had to give up her d-pawn for the opponent’s e-one, with an elementary drawn ending on the board. The indirect defense against queening was 48.Rb7!, and even after 48…e1N+!? 49.Kf2 Nf3 50.Re7+ Kf5, two passed pawns were enough to win, although White would have to demonstrate precise play and avoid dangerous traps. 51.h7 (there is a threat of 52.Rf7+) 51…Ra8, and now not 52.d7 Bb5 53.Re8?? Ra2+ 54.Ke3 Re2#, but 52.Bc1! 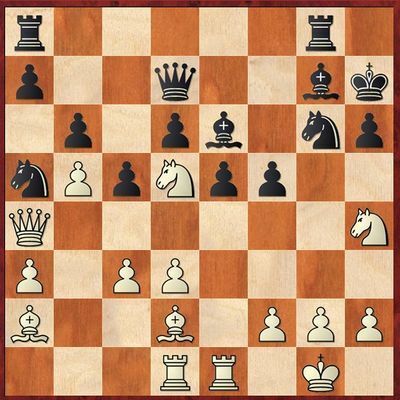 Ra2+ (52…Bb5 53.Bb2) 53.Ke3 Bc4 (threatening with mate on е2 again) 54.Rf7+! Bxf7 55.h8Q. It must be admitted that here conditions of a search for a decisive continuation are much less comfortable than in the position after move 20. Despite all her unfortunate slipups, Ju Wenjun managed to tune up for the next game very well. In the Rossolimo System, Lagno chose a rare scheme. 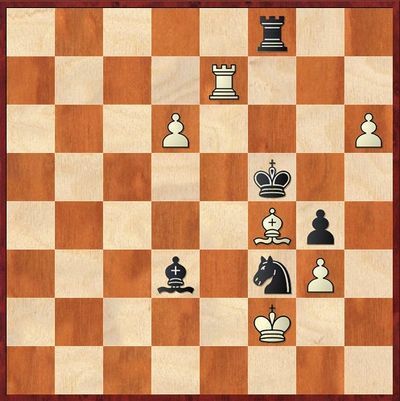 Before that, the position after White’s move 12 had occurred only in the game Boleslavsky-Taimanov played in 1955. 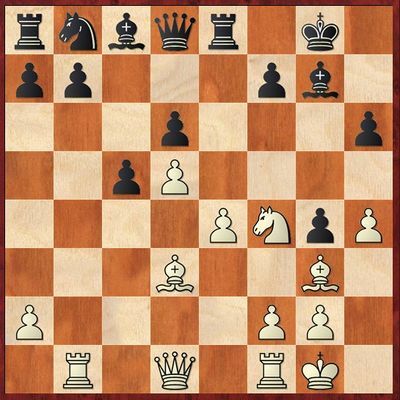 Taimanov took on f5 with bishop and gradually seized the initiative, exploiting opponent’s faltering performance. After making sure that she had a worthy reply 13.Ng5+ to the one-move attack 13.Ng5+, Ju, aiming at a more complex play, opened up the g-file with 12…gxf5. Still, the Russian should have made the same move and then continued 14.Nxe7+ Nxe7 (if 14…Qxe7, then 15.Nh3 and, depending on circumstances, either f2-f4 or Nf4) 15.Nf3 (15.Ne6 Bxe6 16.Bxe6 d5 is unclear). Now White would meet the immediate enemy king’s “homecoming” with check once again, silently offering a draw, and in other lines, her chances in the struggle for the initiative were no worse. 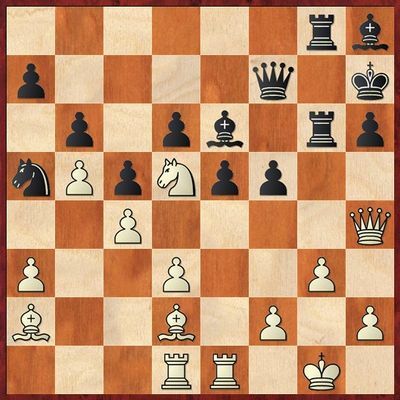 In the continuation chosen by Lagno, her pretty-looking knight is actually rather useless, while Black, under the cover of her strong pawn center, starts to prepare her pieces for the attack against the king. White’s desire to thwart those plans led to a tactical error, which, however, was left unpunished. White had just moved 19.Nh4, and the World Champion overlooked the jab 19…c4! that would cut off both knights. After 20.Nxg6 Bxd5 21.dxc4 Be6 22.Nh4 Bf6 23.Nf3 Qb7, White finds herself in the crossfire and loses material. In the game, Black continued her positional assault with 19…Bh8 20.Nxg6 Rxg6 21.Qh4 Rag8 22.g3 Qf7 23.c4. Computer does not approve of the exchange 23…Bf6 offered by the Chinese player. However, for one thing, even variations that definitely “smack with silicone” do not promise any considerable advantage here. 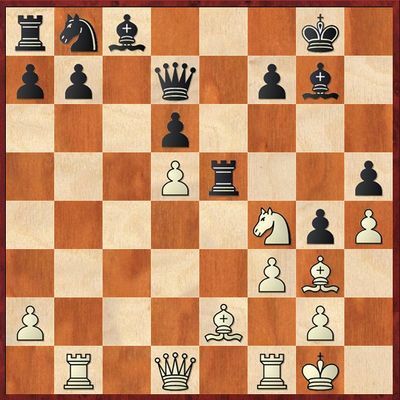 From the human point of view, the only exception may be a logical attempt to include the knight into attack, but, after a rough continuation 23…Nb7 24.Bb1 (preparing to meet …f5-f4 with d3-d4) 24…Nd8, Black faces a rather difficult task of further regrouping, as in various lines she would have to reckon with either queen’s or knight’s thrust to е7. And secondly, after the text move, all black major pieces are gathered on the g-file waiting for a proper moment to deal a decisive blow. Who, at the sight on the threat …Rxg3+, would be cool-headed enough to leave the key point to its fate and play 28.Qh5!, preventing a possible march of the h-pawn into the bargain? The immediate sacrifice does not win, while attempts at preparing it give White enough time to fortify her position. 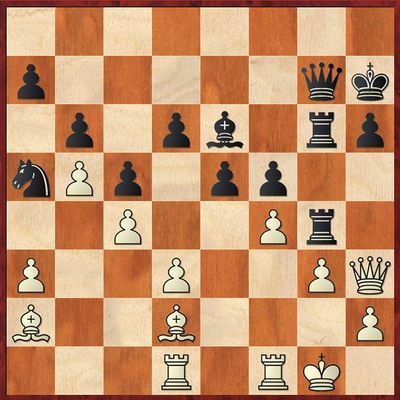 In severe time-trouble, Lagno made a self-suggesting move 28.Kh1 and after the reply 28…Bc8!, it turned out that white king cannot hide in the corner. In a few moves, White resigned because of unavoidable mate. During the tie-break, both 25-minute game were smoothly drawn. In the first 10-minute game, early simplifications led to an equal endgame. Even after Lagno had ceded a pawn for no reason at all, a draw remained the most probable outcome. However, the Russian made a mistake of leaving another pawn defenseless and soon had to give up a piece for the opponent’s passed one. Having taken the lead, Ju Wenjun with White blocked her opponent’s attempts at complicating play confidently. In a quiet level position, Lagno quite unexpectedly blundered away her queen, and the World Champion won the match by two points.